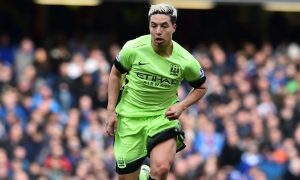 Manchester City are struggling to attract buyers in Europe for playmaker Samir Nasri – mostly down to his high salary – but according to an exclusive report in The Sun, a Chinese club are not only willing to match his City salary but increase it significantly. Shanghai Shenhua are one of four teams to have been linked with the 29-year-old in recent days, along with AC Milan, Galatasaray and Besiktas. Turkish teams tend to window shop and make derisory loan offers more than buy big names, while calciomercato.com claims that Nasri has been offered to Milan, but they are unconvinced by his ‘unreliable profile’, both physically and mentally. But according to The Sun, Gus Poyet’s Shanghai Shenhua are willing to offer the unwanted Man City midfielder a staggering £275,000-a-week TAX FREE to join the revolution in China, which has seen the likes of Carlos Tevez, Oscar and Ramires head to the Far East on eye-watering salaries. City are happy to take around £12 million for Nasri, meaning with the new ‘100% tax’ in China, Shanghai would essentially be paying £24 million for Samir before wages were taken into account. The question is, does Nasri want a move to China or will he hold out for more offers in Europe, knowing he has no future under Pep Guardiola at Manchester City? A move to Shanghai Shenhua would see him reunite with former City teammate Carlos Tevez.